Students will learn how to recognize and remember the sounds of both short vowels and long vowels. Students will be able to produce the sounds of the short vowels and long vowels in isolation. Vowels in the English language can represent a variety of sounds. The first step in mastering the various vowel sounds is learning the difference between short vowels and long vowels. Of the two, the long vowels are easier for children to learn because long vowels basically sound the same as the letter names. For example, long a sounds like the a in able, long o sounds like the o in over, and long u may sound like the u in use or the u in blue. Children generally find it more challenging to learn the short vowel sounds because many of them sound so similar to each other: The short i in pig sounds very similar to the short e in peg. The short o in pop sounds a lot like the short u in pup. Before children can learn the rules for spelling and reading short and long vowel sounds, they must be able to recognize and produce these sounds reliably. The short vowels can represented by a curved symbol above the vowel: ă, ĕ, ĭ, ŏ, ŭ. The long vowels can be represented by a horizontal line above the vowel: ā, ē, ī, ō, ū. Here are some examples of short vowel words: at, egg, it, ox, up. Here are some examples of long vowel words: ate, each, ice, oak, use. When students have learned to recognize the vowel sounds in Oh, Do You Know?, they can learn short vowel spelling patterns through the Volume 1 song Spelling Families. Long vowel spelling patterns are covered in the Volume 1 songs Talking and Walking and Silent E. Some other songs that teach students about vowel spelling patterns are the Volume 2 songs, Spelling Choices, Cool Vowels, The Right Diphthong, and I Before E, and the Volume 3 songs Why Does Y? and Drop It!. Letter cards for a, e, i, o, and u. Note: If you do not have the CD or Mini-Charts, you can still teach this short vowels and long vowels lesson plan using the folk tune listed on the Oh, Do You Know? Song Lyrics page. You can create your own mini-charts using the words in bold print letters in each verse of the Song Lyrics. Review the letter names of the vowels: a, e, i, o, u, and sometimes y. Say, "Today, we are going to learn about how vowels can sound in words. We will focus on a, e, i, o, and u." Display letter cards a, e, i, o, and u. Say, "Sometimes it is easy to hear the vowel in a word. Can you tell me what vowel you hear in the word use (u), in the word eat (e), in the word ape (a), in the word ice (i), in the word oak (o)?" Point to the correct letter card, each time the children answer correctly. Say, "It is easy to hear the vowels in these words because they actually say their own names. When vowels sound just like their own letter names, we call these long vowels." Display the chart of the long vowels with pictures and symbols. Point to the long vowel chart and say, "We can draw a long line over the vowel if we want to show that it has a long sound. Ask the students to draw this symbol in the air. " Point to ā, and say, "Long a sounds like the beginning of ape." Say together, "Long ē sounds like the beginning of eagle. Long ī sounds like the beginning of ice cream. Long ō sounds like the beginning of ocean. Long ū sounds like the beginning of unicorn." Say, "Sometimes a vowel has a different sound and does not say its own name." Show the chart with the short vowel words and pictures. Say, "This chart shows words that have a short vowel sounds." Say, “Now we are going to listen to a song about the vowel sounds to help us remember them. At first, the singers will sing about all the short vowel sounds. Next, the singers will sing about all the long vowel sounds. See if you can think the sounds for each vowel before you hear it in the song.” Play Sing Your Way Through Phonics Volume 1 CD, Track 9--Oh, Do You Know? and point to the Mini-Charts on pages 42-46. Point to the symbols on the chart and say, "Did you notice that the short smile and the long line can be written over either capital or lowercase letters? Let's listen to this song again and see if you can answer the singer's questions. Re-play Sing Your Way Through Phonics Volume 1 CD, Track 9--Oh, Do You Know? Students will hear the question, "Oh, do you know the short a sound, the short a sound, the short a sound?" They should sing the answer, "Oh, yes I know the short a sound. The short a sound is /ă/." For the rest of the questions in the song, students should sing the aswers, "The short e sound is /ĕ/...The short i sound is /ĭ/...The short o sound is /ŏ/..., The short u sound is /ŭ/..., The long a sound is /ā/..., The long e sound is /ē/..., The long i sound is /ī/..., The long o sound is /ō/..., The long u sound is /ū/." Teachers can point to the children to cue them when it is their turn to answer the song's question. Listen to the song again, but this time assign a part of the class to sing the song's questions and a part of the class to sing the song's answers. Then switch roles singing questions and answers. Variations: The teacher sings the questions and students sing the answers or vice versa. A small group of students sing the questions and the rest of the class sings the answers or vice versa. Those singing the answers can write the appropriate symbols in the air or make large symbols with their arm positions as they sing the short or long sounds. Examples: Hold arms out to the sides arching upward for short vowels. Hold arms straight out to the sides for long vowels. Practice singing Oh, Do You Know daily for a few days. Then try singing the song without hearing the words, using the instrumental track (Track 10). Allow different students to point to the Mini-Charts words while singing. As a learning center task, have students match pairs of picture cards with the same vowel sounds (Ex: cat/hat, snake/rake). Note: At this point in their learning, it is easier for children to do this task if rhyming words are used. 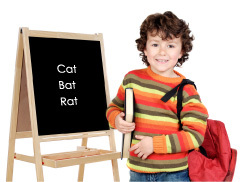 As they advance, they may be able to match short common vowels in pictures of non-rhyming words such as bag and bat. Introduce the Read-and-Sing Book, Oh, Do You Know?. The comical illustrations provide several examples of each sound in the song. When children sing, "Oh, do you know the short a sound? ", they can point to cats, apples, ants, an ax, a hat, and a basket. For long a, they will find Amos listening to the radio, holding a May calendar next to a table with cake, maple syrup, grapes, and plates. After children can remember all the vowel sounds, they can sing on their own with the instrumental version of the song and perhaps create their own short and long vowel pictures. They will also enjoy grouping objects that have the same vowel sounds or creating collages of magazine cut-outs. Keep a few copies of the book at a literacy center equipped with headsets so that students can gain practice in listening, singing, and remembering the sounds of the long and short vowels. Using 3-letter or 4-letter words, explain the rule that when one vowel is in the middle of a word, it is usually short (Ex. bag, sit, bed). Print some of these words on a word wall. Pointing to an appropriate word, perform this rap to reinforce the short vowel rule: "Got one vowel in the middle of the word, got one vowel in the middle of the word, got one vowel in the middle of the word--Say /ă/, say /ă/, say /ă/ [clap-clap]. Repeat by pointing to another appropriate word and another short vowel sound until all short vowel sounds have been covered. Variations: Add back and forth side-steps while reciting the rap. Change the ending claps to taps, stomps, or knocks. Add rhythm instruments to help keep the beat. Find short vowel words in children's books and poems. Examples: From Shel Silverstein's Poetry in Where the Sidewalk Ends-Ickle Me, Pickle Me, Tickle Me, Too for short i; Jimmy Jet and his TV Set for short e. Singing games like The Banana Song (using the name Anna). Dr. Seuss' There's a Wocket in my Pocket and Fox in Sox for short o. Nursery Rhymes like Jack Sprat for short a; Diddle Diddle Dumpling for short i, short u, short o, and short e; Hickety-Pickety for short i and short e.
Find short and long vowel sounds in students' names. Ex. Ann, Ellen, Jim, John, Buddy for short vowels; Jake, Steve, Mike, Joan, and Judy for long vowels. Find short and long vowel sounds in environmental words like Exit, Stop, Bus, In. Label classroom objects that illustrate short and long vowel sounds: dĕsk, chāir, tāble, gāme, pĕncils, pĕns, pāper, shĕlf, răck, lĕdge, ēasel. Have a Show-and-Tell time where children bring in objects with a particular short or long vowel sound. Place these or other objects on a table labeled with that vowel and the short or long symbol. Students can produce the correct short vowel and long vowel sounds on Mini-Charts pp.41-46 without assistance. Students pass a written or manipulative test where they match pairs of short vowel pictures and long vowel pictures.